The friendliest of welcomes, with no request too much trouble. plus a variety of accommodations to choose from. The gardens are cool and tranquil, and although it is on the quiet side of town, you are still very central to the main attractions. 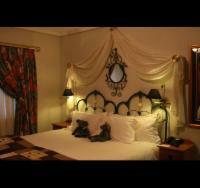 Situated in a quiet residential area in the town of Kimberley, a warm welcome awaits at Aletheim Guesthouse. An old, classic house, lovingly restored, gives one a home from home experience. Whether you choose one of the rooms in the main house, one of the garden cottages, which are fully equipped for self catering, or one of the more modern rooms adjacent the main house, your room will be comfortable with many added thoughtful touches. The garden is a parklike, cool and tranquil oasis with many shady trees, and has a large sparkling pool inviting you to relax and enjoy the attentive service. Breakfast is served in the dining room, or in the comfort of your own cottage or bedroom. Days can be spent exploring the rich history of the diamond mining days in Kimberley, and a visit to the Big Hole is a must amongst the many other attractions in the area. Whether you are on business or on holiday, busy getting around or simply relaxing, a visit here will be memorable. Stay for 5 consecutive nights & receive a dinner free of charge on 1 of the nights to the value of R150 per adult (special applies to adult guests only). No vouchers or money to the value of the meal. Special runs until end September 2019. Please note: The 20% special advertised above will not apply should you choose to stay for 5 nights or longer.